Viveve is a pain free, vaginal rejuvenation treatment, clinically proven to treat vaginal laxity and stress incontinence after just one treatment. Why would I consider the Viveve Treatment? Do you leak urine when you laugh, cough, sneeze or exercise? To request a consultation please call 02890 423 200 or submit an online enquiry to Dr Campbell. Vaginal tissues, just like the skin, change over time. Childbirth and aging are two of the most common reasons why collagen support fibres lose their strength, leading to vaginal laxity / looseness and stress incontinence. Millions of women suffer silently with these problems often resulting in loss of sexual sensation and satisfaction, loss of confidence and embarrassment. To generate healthy, new collagen, enough heat needs to be delivered into the tissue without harming the delicate surface. Viveve was developed and studied specifically for treating delicate vaginal tissue. Viveve uses radio-frequency deep-heating energy with simultaneous surface cooling to safely stimulate your body's natural collagen formation process. 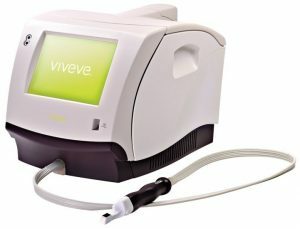 Viveve is a painless, safe, convenient treatment performed by Dr Campbell at the Cosmetech Maypole Clinic in Holywood. During the visit, a small treatment tip, about the size of your thumb, is inserted just inside the vaginal opening. The tip is rotated as it alternately cools the surface and heats the soft tissue beneath. Over the next few months, your body responds to the treatment by generating new collagen and elastin in the vaginal opening. Women feel the results at about 30 days and the full effect at about 90 days. Vaginal laxity - clinical trials show 90% of the women treated reported statistically significant tightening, sensation and satisfaction at 12 months. Stress incontinence - a recent pilot study has reported over 90% improvement in symptoms of stress incontinence with several women reporting 'life-changing' improvements. Many women feel embarrassed discussing pelvic floor problems and often do not realise their problems are common and can be cured. Dr Campbell will work with you to create a bespoke treatment plan, all in the discreet and comfortable surroundings of the Cosmetech Maypole clinic. We are the only clinic in Ireland offering Viveve, which can be delivered in a single, painless, 30-minute session with no down-time. To request a complementary consultation with Dr Campbell please call 02890423200 or click here to make an online enquiry.